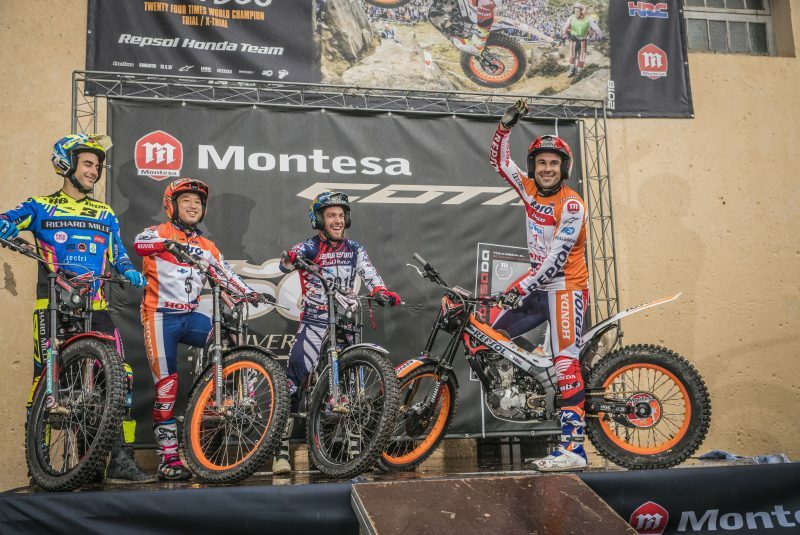 Repsol Honda Team riders Toni Bou and Takahisa Fujinami were two of the most prominent protagonists at Montesa’s grand fiesta, La Montesada. La Montesada is the annual meeting of owners, fans and Montesa followers – an event that has been held since 2001 and which each year fills the small town of Tona with hundreds of Montesas of every description. The participation of Repsol Honda Team riders Toni Bou and Takahisa Fujinami aboard their Montesa Cota 4RTs hogged the limelight at the party where they were met by hundreds of passionate followers of the Spanish brand. All this on the 50th anniversary of the company’s most successful model which is still in production: the Cota. Bou and Fujinami were the main focus of the final exhibition held before several hundred enthusiasts despite the fine rain which fell intermittently throughout the morning. The Repsol Honda Team rounded off the day with a fan photo shoot as well as signing posters and t-shirts.